At the Wednesday, March 8 meeting of the Elk Grove City Council, Mayor Steve Ly tried to wrest control over the job duties of the personal assistant assigned to him and his colleagues. Like other initiatives he has sought during his first three months as Mayor, especially in regards to the personal assistant position, Ly's efforts were blocked by his City Council colleagues. The discussion of the duties of the personal assistant for the five was initiated by Ly during an agenda item covering the norms and procedure for the City Council. During their deliberations, Ly suggested that the procedures need more flexibility so that the assistant, which is the City employee reporting to Elk Grove City Manager Laura Gill, could take direct instructions from Ly or any of the Council Members. Ly said the person might be needed to help him organize community events. According to comments during the deliberations, the position is currently filled by former Mayor Gary Davis' assistant, whom it was implied is on disability. Deliberation comments also suggested that another person would soon be hired to fill the position. When Davis won approval for his assistant in 2015, that employee reported directly to him who assigned and managed their job duties. Once Ly was elected, despite his complaints, that assistant position was changed to help all five Council Members, and be a City Employee under Gill's direction. "I'm just trying to figure the resources so that I can be effective as a Mayor," Ly said. Council Member Steve Detrick pointed out that each of them already has a personal assistant who can work up to 15 hours per week. "That's what we did in our previous meeting," Detrick said. "You got your personal assistant, you got your shared assistant between the two that should be able to cover most of your needs." In response, Ly said "he gets uneasy when we start restricting what they can do." Among the duty changes outlined in the staff report for the assistant are "Unless directed otherwise, the Administrative Assistant to the City Council will open, date-stamp, and deliver to each office all mail received and specifically addressed to the Mayor or a Council member. All intergovernmental correspondence with a time-certain request will be handled directly by the City Manager’s staff." For his part, Ly also noted his job as a juvenile hall teacher did not offer the type of flexibility he claimed his colleagues enjoyed, and that he wanted the position to have more "wiggle room" so the employee can accommodate his needs. "I'll be honest with you, I just don't have the flexibility that many of you do on your day job," he said. "I'm just asking for help." See the second video posted below. Although Ly failed to convince his colleagues, they said they would be willing to look at the matter again once the position was filled. Gill nor the City Council said during deliberations when the position would be filled. 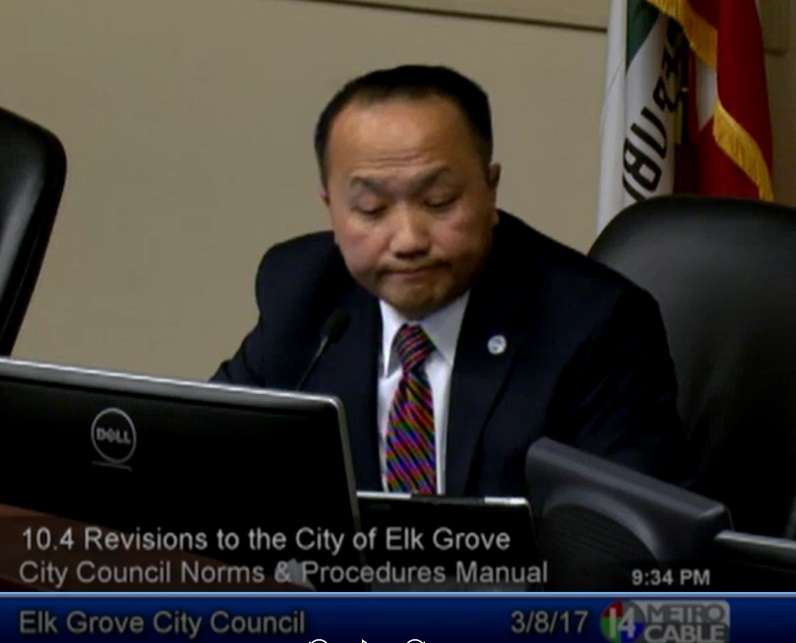 Should the Elk Grove City Council discuss personnel issues in an open meeting? Employers should maintain strict confidentiality concerning employee status, pay, performance and medical related information to the extent possible. Publicly discussing an employee on the record was not only inappropriate but most certainly an argument can be made that a HIPAA violation occurred as discussions about employees' medical-related information is specifically prohibited by HIPAA. By this open discussion by the city council, it is now fair to say that all of the city’s employees no longer have the expectation of privacy regarding personnel matters. So can we can expect all those closed-session personnel matters regarding EGPD, the city manager, city attorney and city clerk will now be discussed in open session meetings? The Council certainly opened the door here. Maybe he should not have taken on the position if he does not have the flexibility to handle the job. I dont think the taxpayer should be burdened with that expense if he is not qualified for the position. Others have done it under the present circumstances. I just think there is EGO here as much as anything else. Mr. Ly, if you need additional help, then tap into your campaign warchest or call up Fresno or St. Paul and pay for your own assistant and have them work out of a private office at your expense.